Show #30 — we have been good this year with our regular posting, and Tee’s got some new drop-in’s!!! This is the end of February, and Katie Bryski is hanging in there with her internship at Casa de Morris! Immortal Progeny — After checking with the Book of George (R.R. Martin), the novel is taking shape. We’re looking overseas with our indie books and our agent of awesome. Apply a few gold medals and Canuck gets cocky! Notes are back from her Stonecoast Mentor. “Research” for her day job…which means she’s drinking beer. Apparently, when it comes to giving us a bit of feedback on how hard Tee & Pip work her, silence is golden. What has Tee been up to? The Billibub Kickstarter is starting to make some headway after one week. 31%. Not bad. The blog machine rolls on with the Endless Possibilities Blog Tour and on TeeMorris.com! Tee’s drinking beer with Katie. Good times!!! 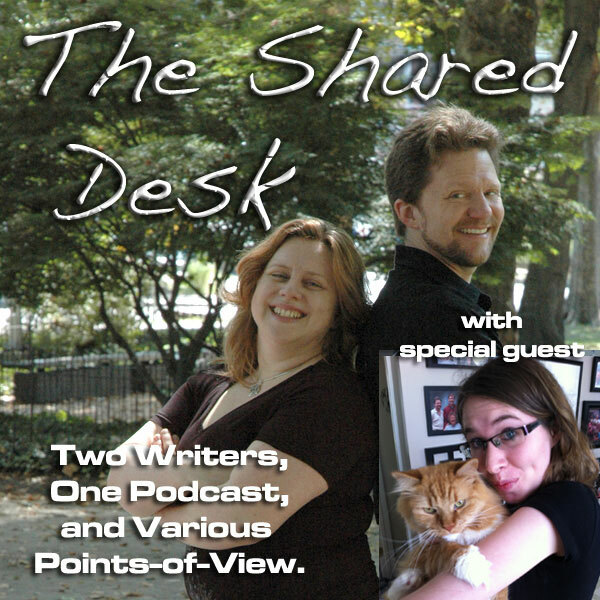 10:15 — What’s a Writer’s Internship? How did this whole idea of Katie becoming our intern actually happen? What does an intern for a writer do? There’s a fine line between intern and stalker. Pip takes a guess as to what you’re supposed to do during an internship? Getting our digital hands dirty with layers. Katie LOVES this program…and templates are her friend! There’s still some terms she needs to get familiar with. Giving books personality with InDesign. Pip and Katie share the story behind Weather Child and how Katie went on a journey with the podcast…and now she’s laying out the book in print. Taking the red pen in hand. It’s a big step in editing another person’s work, but Stonecoast’s lessons were applied. Pip has a pupil in her School of Love and & Despair. Katie is leaving….but she’s not leaving. What did the Intern teach the Mentors? Katie is an impressive student, picking up new tools in audio and video. We learned that our Intern is very possessive. Writers don’t have set hours. Just having assistance in setting up the calendar — awesome! The Intern’s First Assignment when she gets home: The Most Canadian Steampunk EVAR! Jack Mangan, the gauntlet has been thrown! THE. BEST. TELEVISION. SHOW. EVAR. True Detective, on HBO. What is it about True Detective and the appeal of Southern Gothic to geeks? Tee brings on a geekgasm on John Mireau’s Serving Worlds. The method of storytelling between 1995, 2002, and 2012. You have to pay attention with this show. Matthew McConaughey is stepping up as an actor. The characters of this show is like Louisiana — broken. True Detective from a film buff’s perspective. The good news for Katie: She found a source for the last two episodes! Pip Ballantine just ignores the music cue. Shocker that. The rise of the anthology? Is it happening? Katie learned stuff with us…but we still have stuff to be teaching her! Dawn’s Early Light, coming soon! Weather Child, coming on March 1. With the wonders of time-shifting, we talk about tomorrow’s launch of Tales from the Archives which went live yesterday! Drop Tee and Pip a voicemail at 703.791.1701, or drop us a comment here or in email. SHOW #35 ANNOUNCED AS OUR NEXT VOICEMAIL SHOW!!! How do you say goodbye? Giant freaking robots beating up monsters! …and Katie breaks out in to spontaneous song. Tee stumbles though the Creative Commons tag on account of teh feelz. Where do I sign up for classes on how to lay out a book? That is a skill I desperately need.